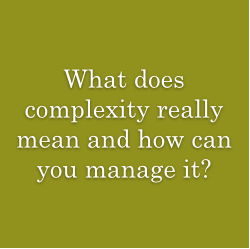 You are here: Home / Learning Centre / What Does Complexity Mean and How Can We Manage It? “Complexus”, the Latin word for “complex”, roughly means “twisted together”. In other words, the coming together and the interaction of several elements that form a “complex system” originate complexity. Such interaction is highly non-linear and produces properties that may not belong to any of the components that come together; in other words, the system created by these interactions can be very different from its components and cannot be understood in terms of them. Complexity is an intrinsic feature of life in all its manifestations. From the biological aspects addressed by life sciences to the cognitive and behavioral aspects originated by human relations. Management, for the purposes of IM, is the science that studies how to create and guide human relationships within the framework of an organization, i.e. a well-defined realm of human relations and interactions. Understanding these interactions involves the re-thinking of conventional organizational structures and the design of suitable Information Systems to support its functioning. Complexity, then, becomes for IM the field of knowledge that examines how human cognition (what humans are capable of knowing) entwined in a suitable organizational structure (a suitable system of interdependencies aimed at well defined goals) can produce long term, sustainable results and contribute to the betterment of the larger systems they are part of. In other words, how organizations can produce economic results within the framework of a human-centered, ecologically-minded vision of the world. This website is dedicated to elucidating on some critical aspects of the management of complex systems and providing a link between its scientific foundations and some practical applications.